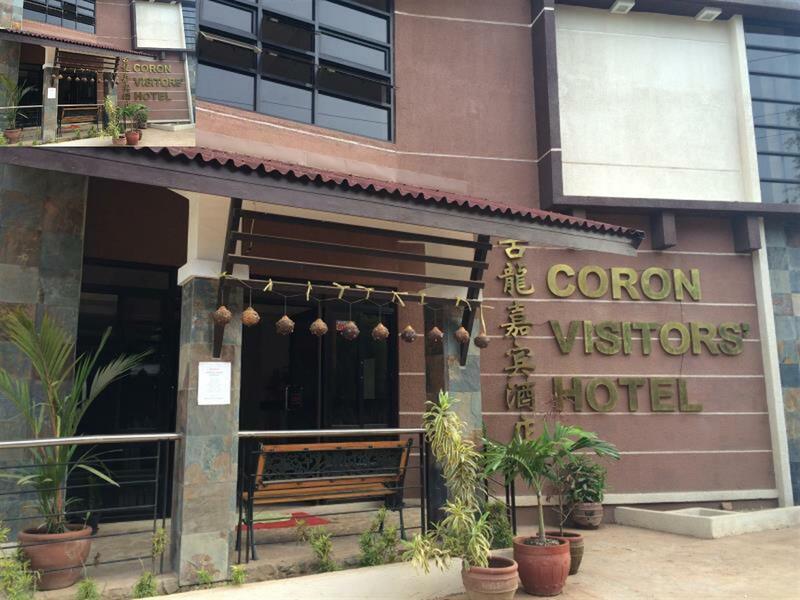 Το Coron Visitors Hotel είναι μια πολύ καλή επιλογή για τη διαμονή σας σε Palawan, είτε είστε τουρίστας είτε επαγγελματίας. Σε απόσταση μόνο 0.06 km από το κέντρο της πόλης, οι επισκέπτες βρίσκονται στην κατάλληλη θέση για να απολαύσουν τα αξιοθέατα και τις δραστηριότητες. Από τη βολική της τοποθεσία, η ιδιοκτησία προσφέρει εύκολη πρόσβαση σε κορυφαίους προορισμούς της πόλης. Οι εγκαταστάσεις και οι υπηρεσίες που παρέχει το Coron Visitors Hotel διασφαλίζουν την ευχάριστη διαμονή των πελατών. Οι πελάτες του ξενοδοχείου μπορούν να απολαύσουν υπέροχες δραστηριότητες όπως τα 24ωρη υπηρεσία δωματίου, δωρεάν WiFi σε όλα τα δωμάτια, 24ωρη φύλαξη, ημερήσιος καθαρισμός, ιδιωτικό τσεκ ιν/τσεκ άουτ. Όλα τα καταλύματα διαθέτουν τις απαραίτητες ανέσεις για να εξασφαλιστεί μια ασυναγώνιστη αίσθηση απόλαυσης. Εξάλλου, το ξενοδοχείο διοργανώνει πολλά ψυχαγωγικά δρώμενα έτσι ώστε να έχετε πολλά πράγματα να κάνετε κατά τη διαμονή σας. Το Coron Visitors Hotel είναι μια έξυπνη επιλογή για τους ταξιδιώτες στη Palawan προσφέροντας κάθε φορά μια ήρεμη και ήσυχη διαμονή. We arrived at 12:30pm and were greeted w/ complimentary glasses of juice while we waited for the room to be available. We booked a Double Deluxe Room, but when we got there we were able to get an upgrade to a Superior Deluxe (Bigger Bed w/ Private Veranda) for a small additional amount. The Room was clean and the A/C worked perfectly (too perfect it was freezing at times, which is perfect for the Coron Weather). The Bathroom was big enough with a clean facilities and hot water. In the morning, we had our breakfast at the Hotel which had set meals good enough to get you through your days tour. Hotel Staff, they were awesome, accommodating, and professional. The location is okay since its accessible via tricycle, but it isn’t necessarily walking distance to coron city proper (It’s Hot, Not Fun Walking). So we usually just took the Trike, which was 5 minute ride. Also, It’s near the Coron Cemetery, Scary but not really an Issue. Upon Check out, they had a summary of our transactions (room, breakfasts, softdrinks, van transfers, tours) ready for payment. All in all, definitely recommend the place, Quiet, Private, Clean, worth the amount paid. Great value for money. The room and bathroom were comfy and clean . Excellent customer service.It may not be walking distance to the restaurants at the center of town but tricycles are abundant here. 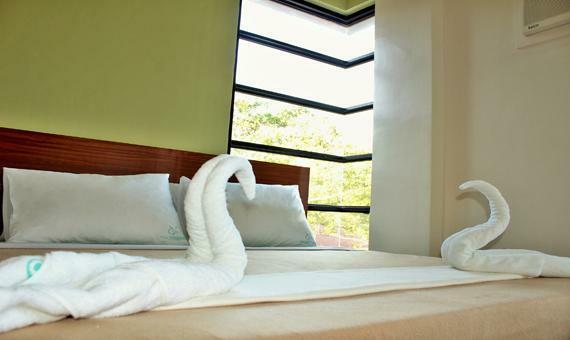 I have traveled to Coron countless times and have always tried different hotels. I daresay, other hotels I have been to before even offer more expensive rates for their disappointing service and badly maintained accommodations. This hotel on the contrary is a gem! There's a good feeling to this place and a big plus is the genuine warmth of their staff. They have a nice terrace and lounge area next to their in house restaurant. For a quiet and comfortable break, it's a great idea to stay here. You should try the in-room massage service as well. I will definitely return here in the future. This place was great. 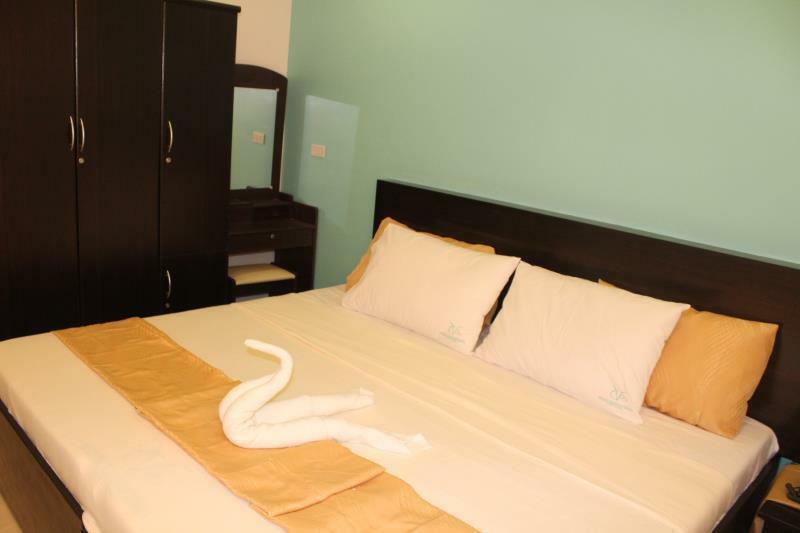 super clean, friendly and helpful staff, short walk to central down town 10min or 2 min with the scooter and comfy beds. We could not have asked for a better place for are stay and for our buck. Woud highly recommend staying here. For me it is rather a bed and breakfast. 4 nights without my room being done once. Breakfast very poor in choice and mediocre quality. Otherwise room is big and the bed comfortable, and there is pressure in the shower. We were greeted with smiles and welcome drinks when we arrived. All of the staff were consistently cheerful and helpful since day 1. The hotel is new and well maintained. Unlimited Coffee, Tea and Water were available in the dining/lobby area 24/7. Luckily have experienced their new lobby facility, OGAWA FULL BODY MASSAGE CHAIRS, oh my! Going home to these chairs after every tours in Coron were the perfect relaxation everybody needs! It was so good for 100php for 20mins! (Full body massages in coron will surely cost you) Beach towels are available for rent at 50php per day. You can also ask their chef to cook your freshly bought ingredients from coron town market for a certain price per kilo. Just make sure you don't miss any ingredients needed. We did a seafood night and it was fairly affordable than eating out (i suppose). Front office staff can also assist you in booking your ride to the airport and other services. Highly recommended for their reasonable room rates. it is located at downtown coron. the hotel is nice the facilities and the room. but it says the view is mountain view that's why I picked our room at the 2nd floor but it's not. haha. i wanted to go back in coron and i will still choose this hotel because it's cheap and nice at the same time. the staffs are nice too! I didn't stay in this hotel because when I arrived there, the reception told me they were already full. Fortunately they found us another hotel which is better and we didn't pay extra money. Overall the attitude of the staff is good. I have seen a previous review and they were very unhappy with the staff, especially the Manager, Olga. I would like to set The record straight. I have stayed here 5 times and find the staff and especially the manager to be some of the friendliest, helpful and accommodating hotel workers that I have encountered in the Philippines! As always, thank you for a great stay. Far better than many places in Coron Center we have looked at! Modern clean rooms. Walking distance to the center but relatively quiet. Breakfast is free so take it or leave it. Staff was helpful and nice. Recommended. This is a very good hotel considering the fair price. Hotel was very clean and still looks very new. Staff were very courteous and friendly. Greets you whenever they see you and assists you in whatever you need. Room is very spacious with hot and cold shower. Suggest the rooms on the upper floor because ground floor rooms get noisy during breakfast because it’s near the food hall. Also, the location is still in town but tricycles passing by are quite few because it’s on a one way route. But when you’re from the town going to the hotel no problem with hailing tricycles although some tricycles ask for an extra amount rather than the usual 10 pesos. Location of hotel is far from the noise of the town so perfect for peace and quiet. Town is a short walk or tricycle ride away. The hotel is clean and the rooms a good size with quiet air con! Definitely a bonus! Staff are helpful and friendly. Breakfast wasn’t included but ham and toast was only 25 pesos each. I would definitely recommend it! I will recommend this hotel to friends. The staff are friendly and helpful. Real value for money. The staff were really nice and helpfull, the room was clean and quite big (with a balcony with not really nice views). The hotel is pretty well located but the wifi connection is terrible and only available in the lobby. We really enjoyed our stay here. The staff always went out of their way to help us. There were a lot of divers staying there and they offered a shuttle to the pier. there was free coffee and water available all day which was a huge plus. All in all, would recommend.